Israeli updates from Joel Rosenburg. As it says in the Bible pray for Israel for her continue to have the Lords blessing to poor down on her. Joel gives us timely and accurate updates as they come in, so we can all stay informed. Here is the latest update from Joel. UPDATE: 469+ ROCKETS FIRED AT ISRAEL FROM GAZA, INCLUDING SOME WITH MUCH LONGER RANGE. JERUSALEM, TEL AVIV TARGETED. HERE ARE THE LATEST DEVELOPMENTS. * Since July 1st, Palestinian terrorists in Gaza have fired more than 469 rockets and missiles have been fired at Israel. Today, Thursday, at least 120 rockets have been fired at Israel. On Wednesday, 105 rockets were fired at Israel. 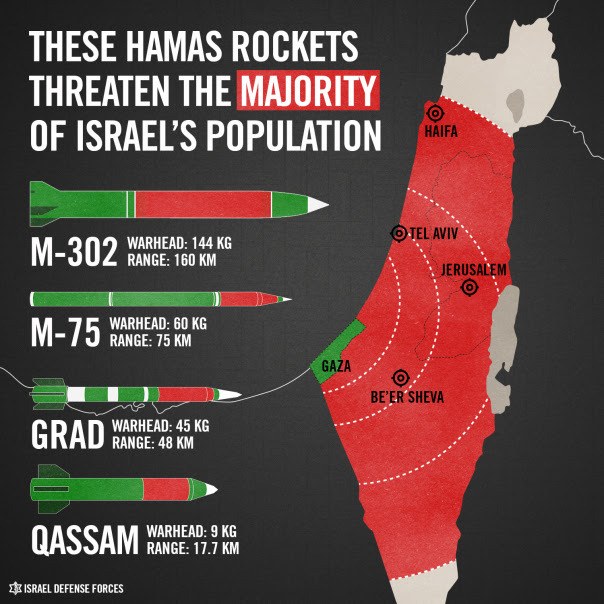 * The terrorists are using rockets and missiles with a much longer range than ever before — they are not only able to hit Tel Aviv, but they are striking targets as far north as Caesarea. These longer range weapons are coming from Syria and Iran. * The terrorists are not firing at military targets. Rather, they are randomly shooting at Israeli cities and towns, trying to hit civilians. Thus, most of these attacks are double war crimes — that is, the terrorists are firing at innocent civilians which is a war crime; and often they are shooting at Israeli civilians from schools, hospitals, apartment buildings and other civilian facilities, which is another war crime. * Remarkably, the Israelis are continuing to send the people of Gaza food and fuel during this conflict — the IDF reports that 1,228 tons of food were trucked into Gaza from Israel on Wednesday, along with 290,000 liters of fuel. * Israeli Prime Minister Benjamin Netanyahu has ordered the IDF to call-up 40,000 reservists for a possible invasion of Gaza — but no final decision has been made and let’s pray that’s not needed and things calm down quickly. * In a particularly disturbing development, the armed faction of the Palestinian political party known as “Fatah” has announced that it, too, is firing rockets from Gaza at Israel — Fatah is the party led by Mahmoud Abbas, the President of the Palestinian Authority. * The IDF has attacked about 780 Hamas and Islamic Jihad targets in the Gaza Strip so far, striking rocket launchers, buildings housing missiles and other weapons, and the homes and vehicles of terrorist commanders. * No Israelis have been killed in the fighting so far, though there have been injuries. Several dozen Palestinian terrorists and some civilians have been killed in Gaza and others have been injured. That said, the Israelis are taking special precautions to minimize civilian deaths in Gaza…. * Please join me in Iowa on August 9th for The Family Leadership Summit. * Are there any moderate Palestinian leaders who truly want peace? Yes. Meet one: Salam Fayyad. * Short video: What does the term “epicenter” mean & why is it important? * “Red Alert” app notifies you every time rocket is fired at Israel so you can pray. * Anne Graham Lotz & new Southern Baptist Convention president call for urgent prayer for a Third Great Awakening.